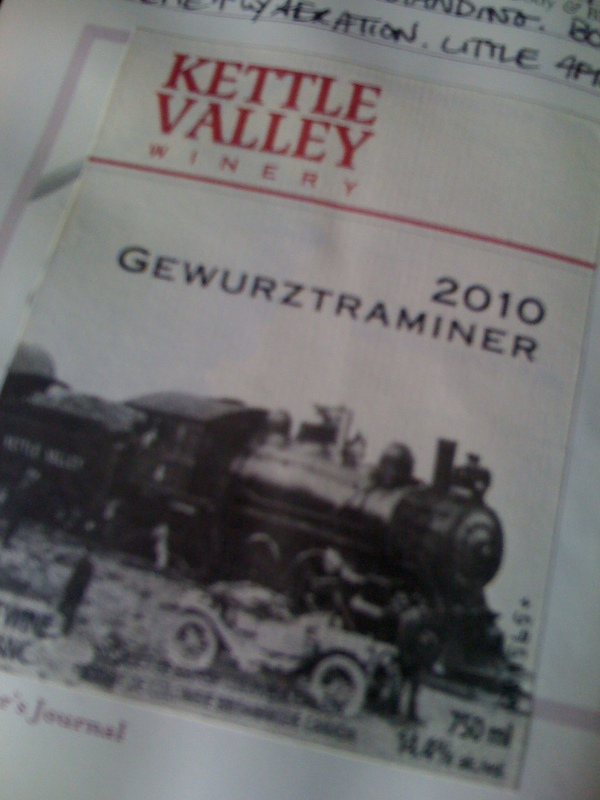 To reiterate: a good Alsatian-style Gewurz with intoxicating aromas and spices is what I prefer out of all styles. According to an article on www.alsace-wine.net, “The nose of [an Alsatian] Gewurztraminer should be complex. Common components are fruits (citrus, banana, litchee, pineapple, star anis) and coconut, honey, spicyness and roses.” There is something about the complexity in a Gewürztraminer from eastern France that just gets my … head spinning. However, if simple fruit floats your boat, this Kettle Valley is a good bet. What kind of fruit is present? I heard you ask that. Well, you get your choice of lychee and peach with this puppy. Let’s get more specific. You get juicy lychee and white peach. There. I said it. I detailed. The label specifies pink grapefruit and rose, but I personally didn’t pick up on those notes. The good news: everyone’s nose and palate are different! While this light golden-coloured wine from the Okanagan Valley had a nice fruity bouquet, it consistently holds lychee and white peach notes on the palate as well. The photographic label told me this product from the valley was 14.4%, and to say the least, it held its alcohol quite nicely. The finish was quick and dirty – but if you like that sort of thing (and you’re not into extreme-style wines such as Alsatian Gewürztraminers), then this just might be the Gewürztraminer for you. There won’t be any competition from me. All jokes aside, Kettle Valley Winery’s 2010 Gewürztraminer is a refreshing light+ bodied wine that will please your guests while supporting BC’s own wine industry. It would pair very well with tangerine and almond insalata verde, or with lemon-buttered white fish. Find this quality wine product at your local Liberty Wines or at Kitsilano Wine Cellar, to name a few. See my Resources page for website and contact info.